A small subunit of the liver composed of cells (hepatocytes) that process blood from an incoming portal venule and send the resulting blood to an outgoing hepatic venule. There are two types of liver lobule, which look at the same cluster of liver cells from opposite ends. Focusing on the outflow of blood, the classical lobule is composed of those cords of hepatocytes that drain blood into an individual hepatic venule. 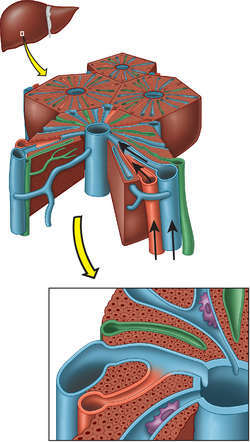 Focusing on the inflow of blood, the portal lobule is defined to be those cords of hepatocytes that drain blood from an individual portal venule. Hepatic vein: A large vessel that receives blood after it has passed through the central veins of the liver lobules. Large foci of cellular alteration (LFCA) were lesions larger than a liver lobule that did not compress the adjacent liver but had alterations in architecture and staining or cellular characteristics. The increased demand for oxygen, in turn, can lead to oxygen deficits at least in certain regions of the liver lobules (i.
Sinusoids: Channels in a liver lobule that conduct blood and nutrients to the hepatocytes, similar to capillaries in other organs. We then determined the incidence of FVIIIRAg expression--positive staining--in the liver lobules of the aged cadavers with progressive stages of fibrosis. Next, we examined the anatomical sites of FVIIIRAg immunoreaction within the liver lobules. Appropriately, the immunoreactivity of vascular endothelial cells in portal tracts and central veins provides an internal positive control for the assessment of FVIIIRAg expression in the sinusoids of liver lobules. Acetaldehyde adducts are found predominantly in a certain region of the liver lobules (2) (i. 2) Liver lobules are the functional units of the liver, a human liver consists of approximately 50,000 to 100,000 lobules.